And 3 reasons against it. I often hear that or similar questions. Many people don't understand why anyone would travel by bicycle. It's so exhausting. For me it's the best way to travel. Why I love it and why the effort is paying off, you can read here. When I sit on the bike I sometimes feel a bit like a snail. Not because of the speed, but because I have my house with me. I am free and flexible, can pause at any time to eat or unpack my Bialetti on the summit of the pass, start the stove to enjoy a coffee with breathtaking views. I'm not dependent on bus or train, can decide for myself when and where to go. I come to places I would never have seen. My bike gives me the possibility of don't-need-to-plan, that leaves space for adventure. Because adventures don't come around the corner during a planned hotel-vacation. The wind blows around my nose. I listen to the birds chirping. I see howler monkeys hanging directly above me in the tree, whales swimming along the coast, a bear waving at us and many more animals. Smelling the blackberries, I'm stopping to fill my stomach. In the car, bus or train I would have missed all of this and much more. On a longer tour you get the chance to have time for yourself and to find yourself. This doesn't happen from today to tomorrow and also not during a two-week pool vacation. I'm no longer in my normal environment, I'm freed from roles I have to perform and now I'm having time and inner peace to think and reflect. It changes you. You have the chance to get to know you differently. I actually had 'aha moments' in which I had to look inside myself and suddenly had to laugh. Likewise, I get to know my own limits, can react better to specific situations, collect knowledge of human nature, gain patience and strength of character. I learn so many new things. For example, how I patch a flat tire. Likewise, you will find your own rhythm and learn about your body. This applies both to the daily cycling as well as to the travel rhythm in general. At the beginning I often cycled too fast and with too much force up the hills, which then paid off negatively mostly in the afternoon. I had significantly less energy then. Thus, over the course of time, I have learned how to assess my reserves. That is the same with cycling on passes for days. I know when I have to end for the day, so that i can still have power for the next day. 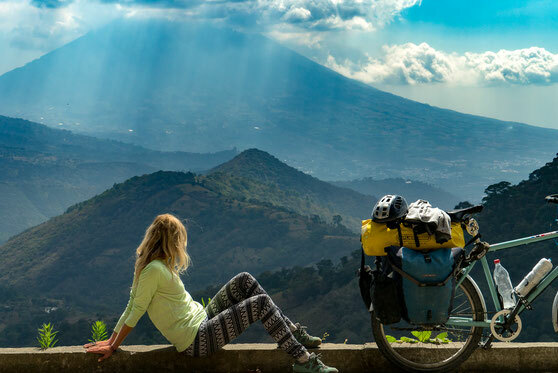 Compared to other travel forms, biketouring is one of the most affordable. Some long-term cyclists spend 4000 Dollars per year or less. I spend about 350-450 Dollars a month. I have described this here more detailed. This is due to two reasons: I have no transport costs. Also you have the freedom of (wild)camping, which makes the whole thing very cheap and you can also cook for yourself. The speed is just right: it is not too fast and not too slow. The bike gives me the oppurtunity to get forward and to be independent. At the same time, I have the freedom to get into remote areas (compared to traveling by foot where you sometimes get stuck). Cycling through small villages, which the normal bus traveler only sees through the window. I can choose less busy roads. There are no other tourists and the people you meet are curious, open and invite you often. This way you get to know a country more authentic, not just from the normal touristic perspective. The locals show you 'their' country, show you the local sights, invite you to festivals, cook local food, take you to their work as a teacher, so you can get to know the children of the village school and exchange smiles, etc. I don't just check the boxes on a to-see-list, but get to know a country, its people and culture. "Traveling or being traveled?" Stefan Zweig asked, and it was him who already wrote about the concept of 'slow traveling. It fits into the same division as the current awareness trend, which is about slowness and enjoyment. Short form: The path is the goal. I could tell hundreds of stories. Because of getting to know so many people I'm experiencing a lot. The travel form itself invites many to ask questions. And the best thing about it is, that all these stories make me rich. Rich in memories, on which I think with laughter or smirk. Nobody can ever take them away and they have an unspeakable value for me. Okay, this applies for traveling in general, but bike touring does this even more intensively. People face you with curiosity and openness. The bike acts as a magnet: many start a conversation, ask how far you go, etc. Sometimes these encounters end in invitations (see point 6). This also has to do with the fact that a bike tourist looks vulnerable. Randomness happens often: someone stops by the car, opens the window, gives us a bag of shrimps, closes the window and drives away. Without having a chance to understand what actually happened or being able to say thank you. Since our daily news consists mainly of horrible reports, you can sometimes loses sight of reality. You'll learn to see the good in mankind again. I met so many great and heartful people, was invited to so many things and I was helped so often. This makes me happy and grateful. Also, distances suddenly appear different and relative. It changes your thinking when it comes to that. 80 km by car seems nothing, on the bike however a mountainpass and 40 ° C feels quite different. It will be even more severe when you push your bike through mud. Even one kilometer is a challenge then. 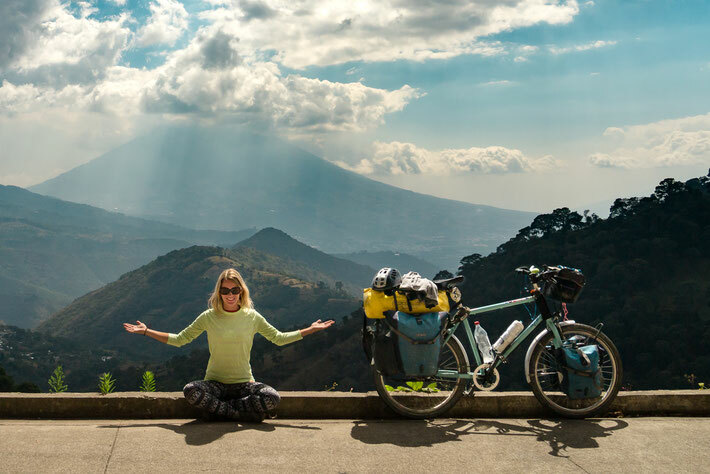 Already before my departure, I was fascinated of the bike touring community. I have texted with many other cyclists or even called without ever having seen them. I was helped during the preparations and I can write to others and ask for route tips. The same thing happens to me now: I already answered mails, in which I was asked about my route. Cyclists who I met on the road and rode together for a couple of days or months turning into close friends. Via Instagram, I've met a lot of other cyclists, the same goes for Facebook. On Facebook for example, strangers helped me to find places to stay. Not to mention Warmshowers. So many helpful and cordial people who have already let me into their houses and their family. 12. Riding a bike is fun ! In the original German blog I quoted at that point a famous Austrian writer named Stefan Zweig [1881 - 1942]. Unfortunately I couldn't find an official translation online, but there is an official translation from his book "Journeys" in which you can find the essay I'm going to quote now. So I'm just making clear that this is a free translation by myself, not an official one. "But still, there is no psychological charm in this mechanical uprising [Stefan Zweig talks about mechanical mountain railways], it lacks in a strange prickling pride, the feeling of conquest. And this strange feeling, which belongs to a true experience, is dispensed with by all those who are being traveled instead of traveling on their own, who somewhere at a counter pay the price for the round trip from their wallet; but not the other price, the higher, the more valuable, from the inner will, the strained energy. And strangely, this expenditure reimburses later. The memory only remains particularly luminous and strong, where we have made an impression with anger, inconvenience, and error; you like to think of nothing more than the small laboriousnesses, the errors and tribulations of a journey, just as in later years you'll love the most stupid idiocy of your own youth the most." The experiences will not fade quickly and the landscapes have become memorable, as I didn't just see them passing while sitting in the bus, but I have fought for them myself. Furthermore I remember the days when I fought on steep gradients or in the deep mud. I think of them and have to laugh. I probably don't have to explain that you get fit during such a tour. You'll also know that sport is producing happiness homones and helps relaxing. Sport in the fresh air is even healthier. You also sleep deeper and better. Another plus for many - if not for me - is the weight loss. I even got to know some bike travelers, whose main motivation was weight reduction. Even if not for me, many cyclists are happy about the fact that they can eat so much and everything they want during a tour without gaining weight. 15. It makes you proud ! It's hard work, but it pays off. Looking at the map of North and Central America, I get an indescribable feeling. 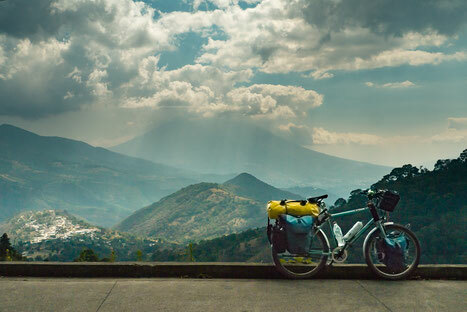 Damn - I rode from Vancouver to Guatemala by bike. Only with my own strength. Point number one on the list above is also a minus point at the same time. Everything always has to be practical. As a cycleGIRL I miss my clothing selection now and then. I must admit that. Even if it worked with only a few clothes for over a year, I would like to have something different from time to time. Sometimes a beautiful dress or simply dressing up a bit. Or maybe just a change (I've changed a few tops, I just can't see them anymore.) The trend of minimalism is good, but: I love reading books, the smell, the cover, the page turning. A Kindle is practical, but has no soul. Likewise, I can't buy anything. Although I like to buy small things here and there to keep them as a reminder. The same applies to minimalism when cooking while camping. There is only a small variation of food. The place and the weight of the subject restrict enormously (whereupon you can get diversity in food if you go to restaurants and so on). Every cyclist knows this, whether on a trip or at home. Imprudent drivers endanger lives to overtake us. On a trip, you can minimize the danger by looking for roads or trails less travelled. It is anyway nicer to not ride next to car noise all day. Not everyday is super great and sometimes you have to bite your teeth [=german saying; means to pull yourself together]. Also you have to spend time for route planning, etc. (unless you make a booked cycle trip), organize etc. It is definitely not just a relaxing holiday. You can get sick and to cycle then is not fun. There are long mountainpasses which want to test you. Before every curve I'm always hoping to have reached the highest point behind it, then I ride more, the view behind it opens up and I see how it continues to go uphill. The wind rarely wants to be helpful. I have been following you since you started and want to say thanks for all your posts and for the above blog post. I start on a 7000 km trip across the northern USA next month on my Surly Disc Trucker. You have inspired me! thank you so much for your words. It means a lot to me to read something like this :) I hope you have a wonderful trip! Would like to see pics from that!!! eine schöne Aufstellung und wahrscheinlich um so besser nachvollziehbar für mich, wenn ich nach meiner mehrmonatigen Sommerreise mit dem Fahrrad zurück bin. Vielen Dank dafür und weiterhin eine angenehme und sichere Fahrt mit dem Fahrrad.